If you are using a 64-bit machine you can install Appeon Mobile (32-bit) to the 64-bit OS without any special configurations. But if you have a previous version of Appeon for PowerBuilder (64-bit) already installed on this machine then you must uninstall it first. Step 1: Open IIS Manager, right click the top node (not the website node) in the treeview and select Stop from the popup menu. This will stop the entire IIS. Step 2: Close any opened window, especially SAP PowerBuilder and IIS Manager. Step 3: Uninstall all of the Appeon components including Appeon Server, Appeon Developer, and Appeon Help. You will need to uninstall these components one by one. Double check the Control Panel\Programs\Programs and Features and make sure no Appeon component is listed. Open a command prompt window and then type regedit<Enter>. Double check that no ADT or ASN keys are listed under HKEY_LOCAL_MACHINE\SOFTWARE\Appeon\<version_number>. Step 5: Clear the Internet Explorer cache and temporary files. Step 6: Delete the entire Appeon folder from C:\Users\User_Name\AppData\Roaming\. Step 7: Delete all the Appeon application folders from the IIS Web root. For example, under C:\inetpub\wwwroot\ at minimum you should delete the following folders: appeon, appeon_acf_demo, appeon_code_examples, pet_world, sales_application_demo. Step 8: Restart the machine. 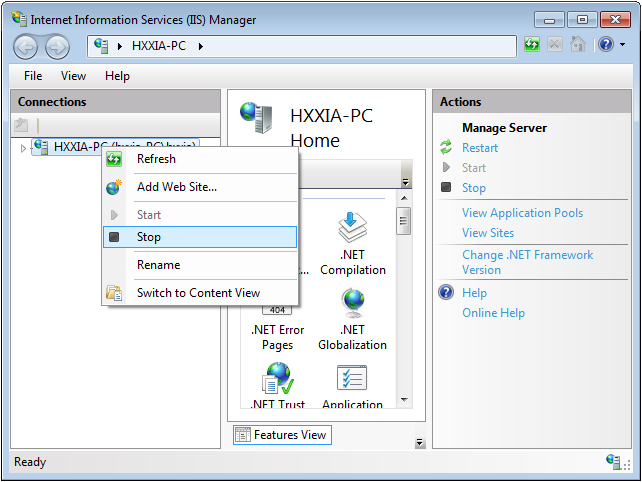 Step 9: Start IIS by right-clicking the top node in the treeview in the IIS Manager and selecting Start from the popup menu. After that, you can proceed to install Appeon Mobile by following steps in Task 2: Install Appeon Server & Appeon Developer.